With a three games to none series lead, Terry Collins Mets were looking for the sweep tonight to advance to the 2015 World Series. 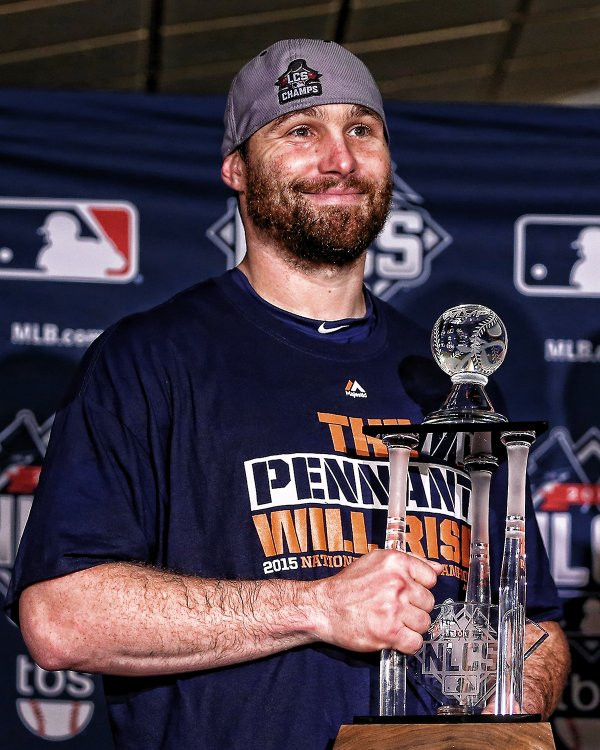 They had the hottest hitter in the history of the world, Daniel Murphy ready to break the post season consecutive HR record & yet another fine young pitcher ready to start. Steven Matz went up against Joe Maddon & the Cubs' Jason Hammel, hoping for a miracle. But in reality he didn't have a prayer. Curtis Granderson led off the game with a line drive base hit to left field. Next David Wright struck out & then Daniel Murphy actually popped out to third base. With two down, Granderson eventually stole second base. Next, Yoenis Cespedes drew a walk putting two men on for Lucas Duda. 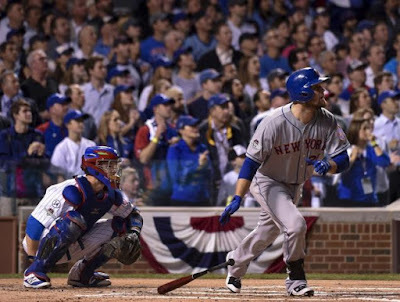 Sooner or later it was going to happen, it was long over due, Duda cracked a HR to the center field bleachers quickly putting the Mets up 3-0. Duda had hit 27 HRs in the regular season, and had been slumping throughout the playoffs, setting a new strike out record going down 13 times. The crowd at Wrigley Field went quiet & although they put their heart into it at certain times during the rest of the night, most of the life was sucked out of them. Then before Mets fans could catch their breath & realize what was happening, the next Mets batter Travis d'Arnaud hit a solo HR of his own. It was 4-0, the Mets were never to look back it was only matter of getting 27 outs & they would be the National League Champions. The Cubs were dead, they were out played in all areas of the game for four straight games. 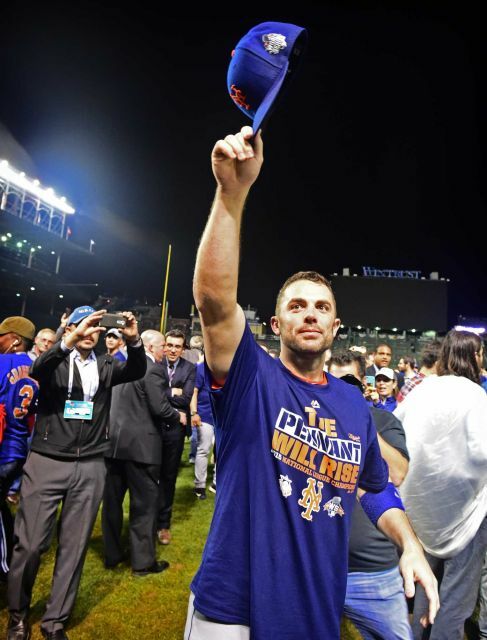 Maybe it was the curse of the Billy Goat, who's name happened to be Murphy, or that black cat who came out at Shea Stadium in 1969, peering his back luck into the Cubbies dugout, or maybe both of their ghosts returned to haunt the 2015 Cubs. Trivia: The back to back HRs were the first Mets post season HRs, since Darryl Strawberry & Kevin McReynolds went back to back in the 1988 NLCS against the Dodgers. 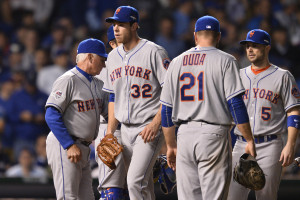 The Mets sent nine batters to the plate in the 1st inning so it was the top of the order in the 2nd. David Wright drew a walk & Daniel Murphy then singled to left field. With two outs Lucas Duda came up & lines bullet to the right field wall. 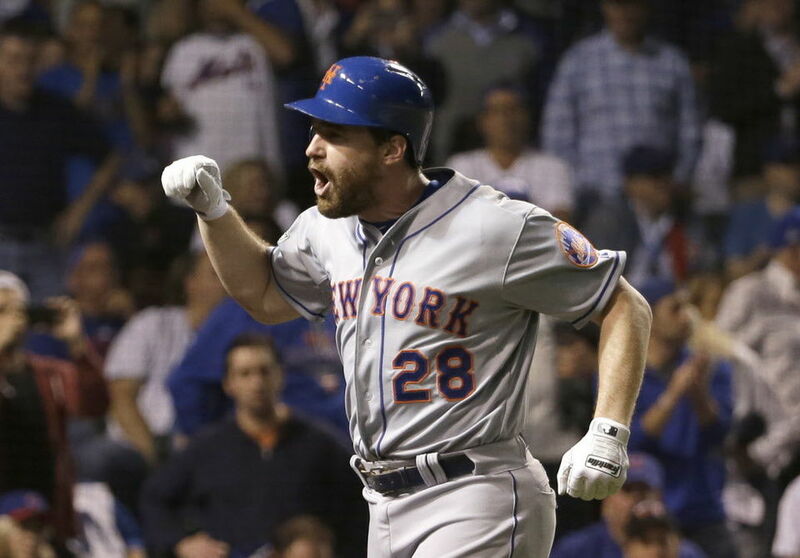 Wright & Murph both scored making it 6-0 Mets. Trivia: In his first two at bats in this game, Duda set a Mets franchise record with five RBIs in a post season game. Note: Yoenis Cespedes was taken out of the game in the 2nd inning, with sore shoulder. Joe Maddon would go through seven Cubs pitchers on the night, by the way no sign of Arrieta or Lester, they were done days ago. 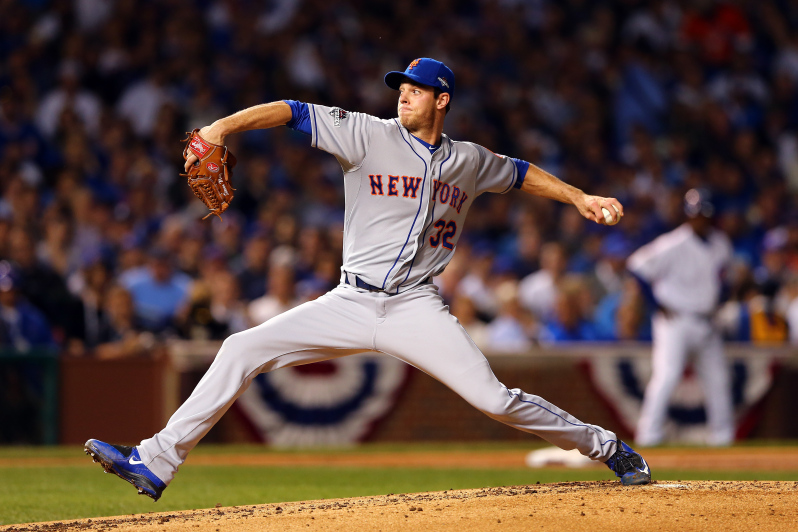 On the mound for New York, the Mets young starter, Steven Matz had a fine outing as he went into the 5th inning, allowing one run, on four hits, two walks & four strike outs. 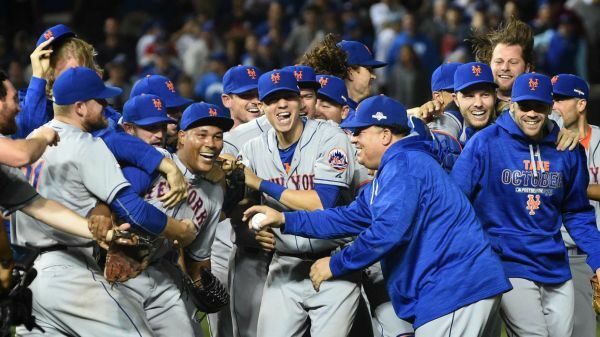 He was relieved by Bartolo Colon, who pitched 1.1 scoreless innings earning the victory. 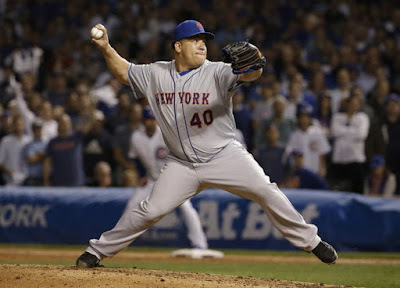 Trivia: With that victory Bartolo Colon made history, by having the longest span between post season wins (14). Addison Reed, had a great three up three down inning 9in the 7th. 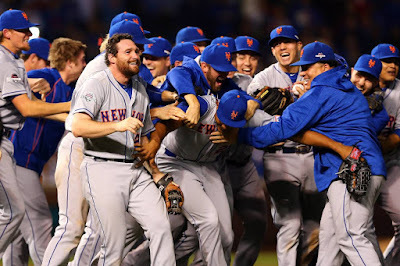 In the Mets 8th, another piece of Mets & post season history was made. 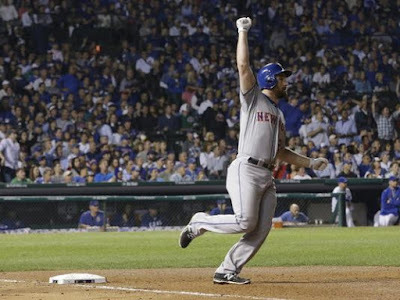 That man again, Daniel Murphy connected for another HR. The two run shot was Murphy's 7th of the post season, in just nine games. 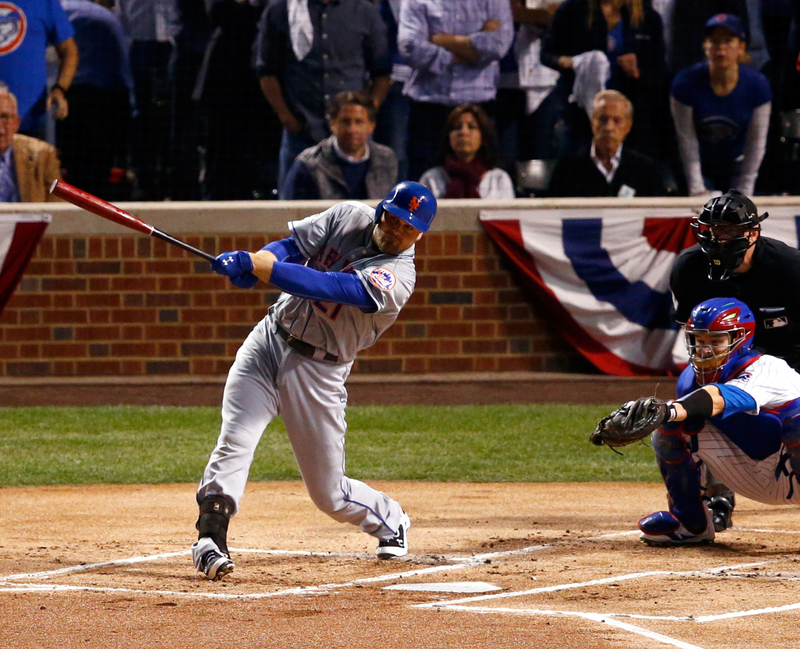 In the home 8th, Tyler Clippard had a shaky inning, serving up a two run HR to Kris Bryant making it 8-3 Mets. 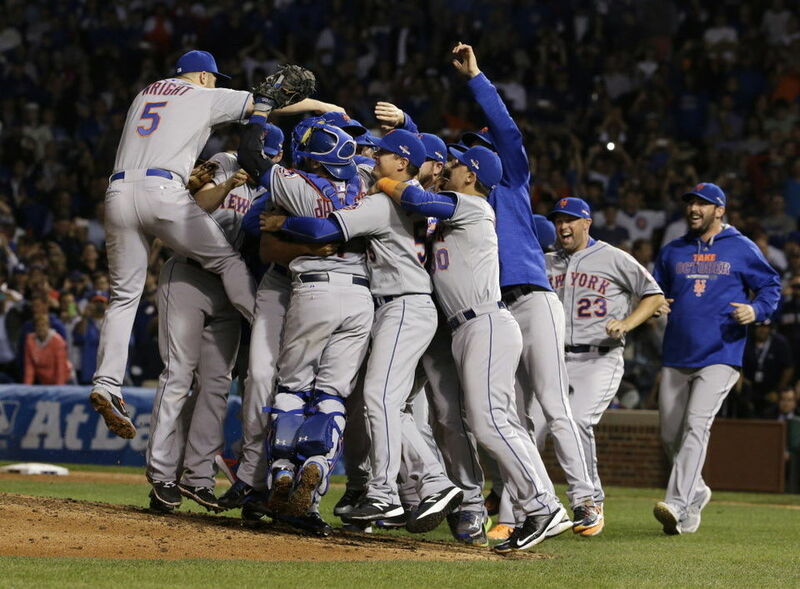 After an uneventful Mets top of the 9th it was onto the final three outs. 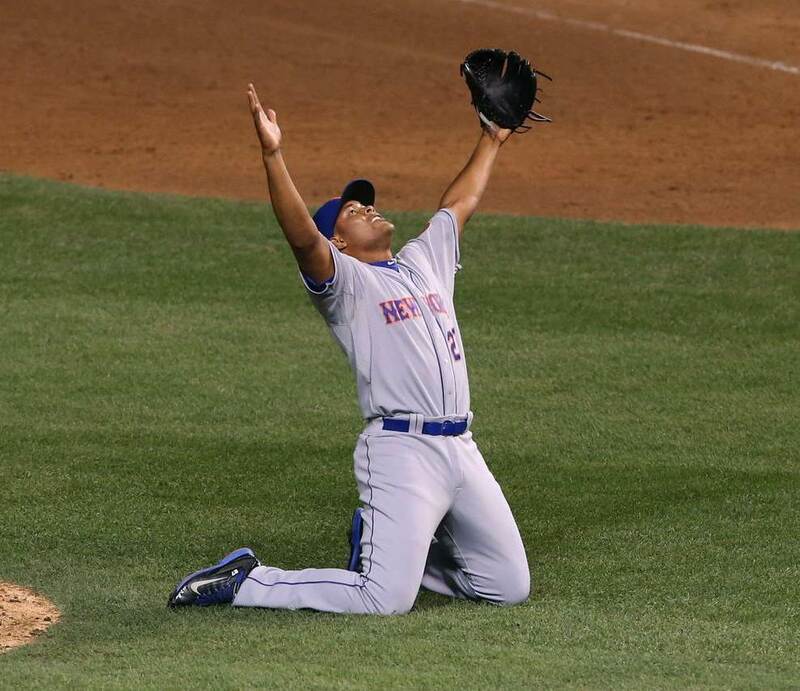 In the 9th it was once again Familia Time. Mets closer, Jeurys Familia came on and got Chris Coghlan & Tommy La Stella to both ground out. 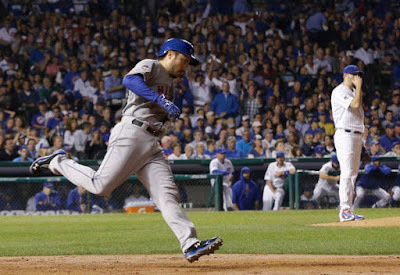 He then walked Miguel Montero to prolong the wait for the celebration. 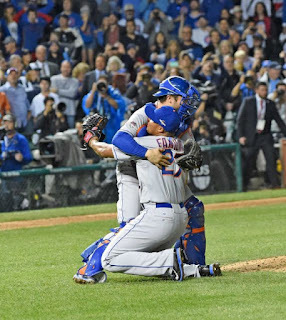 But then fate was sealed, Familia struck out Dexter Fowler looking and the Mets were on to the World Series. 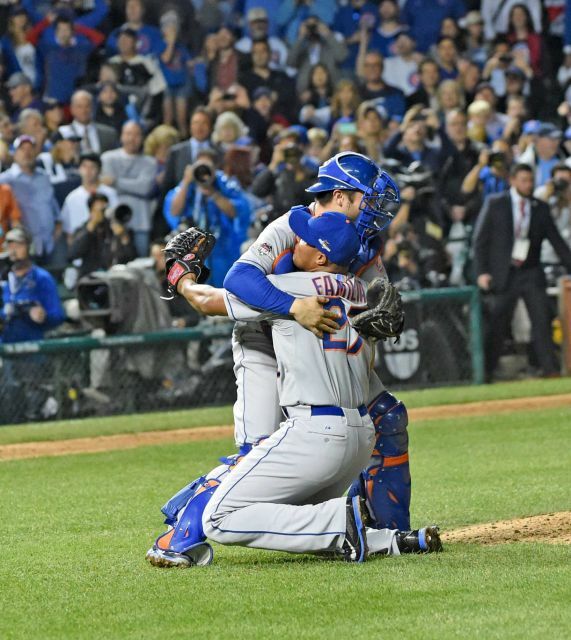 Familia dropped to his knees & was Greeted by catcher Travis d'Arnaud as they embraced the rest of the Mets piled on to the field & celebrated the NATIONAL LEAGUE PENNANT. In Mets history, the Mets are now 5-3 in the NLCS & are going to their fifth World Series. They have beaten the Atlanta Braves (1969) Cincinnati Reds (1973) Houston Astros (1986) & St. Louis Cardinals (2000). In the Fall Classic they are 4-2. NLCS Note: Terry Collins managed to squeeze 12 position players in the game tonight, everyone but back up catcher Kevin Plawecki & reserve infielder Matt Reynolds who has never played a major league game. Quotes: Mets Broadcaster Howie Rose "You can not believe what has become of Daniel Murphy".